The 1855 quarter is a relatively common issue, though somewhat under-rated in XF and better grades. 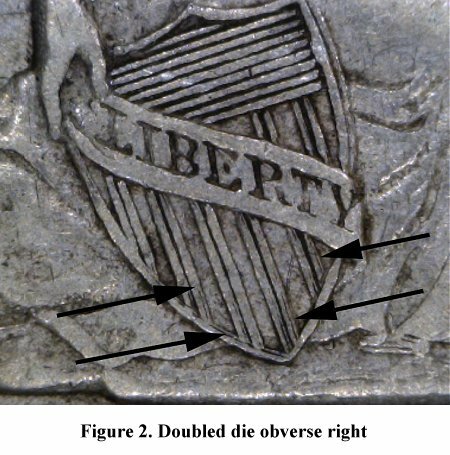 There were no notable, or particularly interesting, varieties described in Larry Briggs’ 1991 reference “The Comprehensive Encyclopedia of United States Liberty Seated Quarters” (Lima, OH) and, despite a 1993 Gobrecht Journal article by Chris Pilliod (GJ #57 July 1993, Collective Volume 4 page 380) noting a doubled die obverse, varieties of the 1855 are not well known or often collected. The interesting thing about the issue is that there is not one, but two distinct 1855 doubled die obverses. In addition to the DDO-Right issue discovered and reported by Mr. Pilliod in 1993, there is also a DDO-Left. 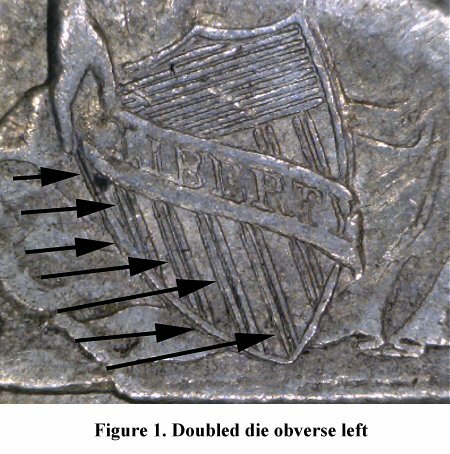 The two obverses are shown in Figures 1 and 2. These doubled obverses are quite elusive, with exactly three of each (counting the originally reported Pilliod coin) personally accounted for in the past six years. A search of the Heritage archive reveals that, though scarce, they are probably not rare in an absolute sense. Heritage has sold a large number of 1855 quarters since the inception of online photographs. A total of 72 of those coins have photographs of sufficient resolution to confidently attribute. Eight (8) of the 72 (about 11%) featured the DDO-Left obverse and four (4) of 72 (about 3%) had the DDO-Right obverse. Interestingly, one of each variety was sold attributed in a SEGS holder in 1999/2000. The highest graded examples in the archive were an NGC AU55 of the DDO-Right and an NGC MS62 of the DDO-Left.